This toddler bed sized quilt was for my youngest granddaughter, and was my own "creation". 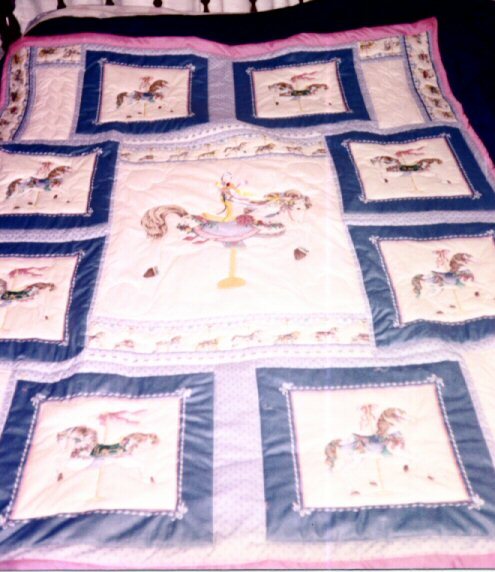 I purchased the fabric with the carousel horse applique print, and used the horse for the center of the quilt. It is appliqued then stitched around each piece as well as some of the contour pieces, all by machine. The borders take advantage of another carousel print, with the machine quilting around the figures in the fabric. 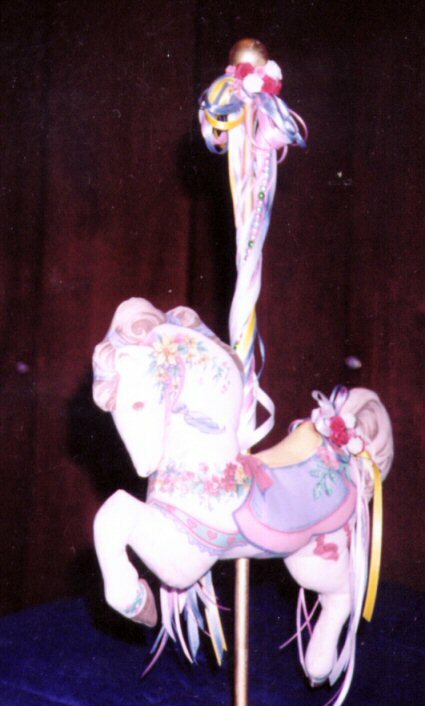 To complete the "ensemble", I made the stuffed carousel horse companion piece that was included with the fabric section. 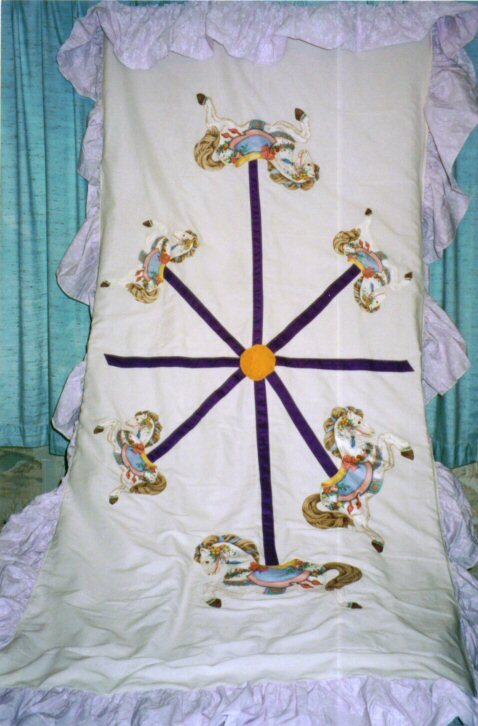 The base is a wooden circle with a large dowel for the pole, and a round wooden bead for the top. I then painted it to go with the set, added the ribbons and flowers., and this project was done. This is the canopy to match the carousel horse quilt made for the same grandaughter. She wanted the canopy for her bed to match the quilt so asked Grandma to make it. Wow.. what a challenge. The first step was finding the left over horses from the quilt. Jackpot!!! There were 6 of them. Now to find a canopy pattern. Easier said than done. Finally a ready made canopy in light lavender was found... on sale no less ... it was my lucky day. With the ready made canopy in hand.. and a beige flat sheet I used fusible webbing and carefully ironed each horse to the fabric. Then using gold for the center post image and purple for the lines, I ironed each to make it look like a carousel going around. I attached this to the underside of the canopy, stitching it securly around each horse on the machine and on each horse.. machine appliqueing each piece through both thicknesses of fabric. With the edges all stitched down it is now a reversible canopy, and can be put on the bed either way. She chose to put it so she can see the carousel of horses as she lays in bed. 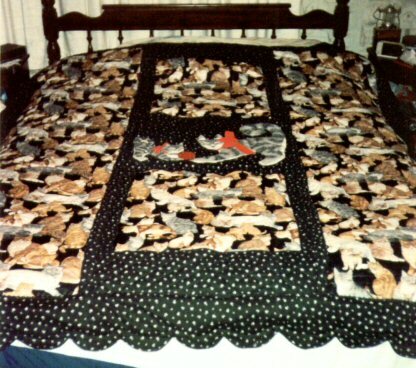 This is another all machine made quilt, using an applique center of a cat pattern fabric. The stitching on the cat is on the contour lines of the figure and around the edges. The border fabric is an all-over cat print, with the machine quilting done around the cat figures. This was done for a lady who loved cats... of course. 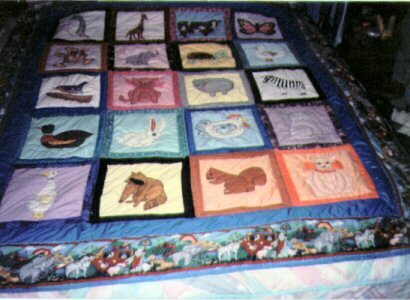 This quilt is my own design, made for a granddaughter who is an animal lover. I used many resources for the animal patterns, from coloring books to clip art. I printed and copied., then cut apart and used for the pattern. I was even able to find a zebra stripe print to use on the zebra. The animals are all appliqued, by hand, then stitched around the edges with quilting stitch. The border is a patterned fabric called "Noah's Ark", which carried out the animal theme superbly. (by the way.. the granddaughter loved it)..